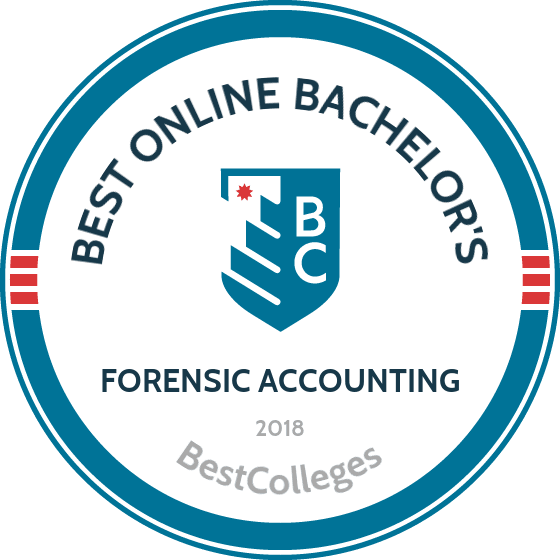 What Are The Best Online Bachelor's in Forensic Accounting Programs? What Else can I Expect from an Online Bachelor's in Forensic Accounting Program? The field of forensic accounting contains many exciting and demanding professional careers. Today, many students choose to earn their bachelor's degree in forensic accounting online rather than in a traditional classroom setting because the flexible online format allows distance learners to balance schoolwork with professional and familial commitments. Undergraduate online accounting programs cover a broad range of topics, including investigation, examination, and prevention of fraud and economic crimes. Students obtain specialized forensic accounting and critical business knowledge, as well as leadership, interpersonal, communication, and critical-thinking skills. Graduates are prepared to sit for professional exams and can become fraud examiners, public accountants, and internal auditors. A healthier economy typically means a greater number of jobs for accountants and auditors. As a result, the field of forensic accounting is currently in demand and is continuing to grow; according to the Bureau of Labor Statistics (BLS), accountants and auditors can expect 11% job growth over the next seven years. The text below describes what you can expect from an online forensic accounting program and the kinds of career opportunities you can pursue after you earn your degree. Earning an online degree in forensic accounting equips learners with a broad understanding of accounting principles and specialized forensic accounting knowledge. Forensic accounting programs focus on the investigation of complex financial transactions, statements, reports, audits, and records. They also cover all aspects of fraud forensics, from detection to prevention. Graduates gain leadership, interpersonal, communication, analytical, and critical-thinking skills. Certain programs offer hands-on curricula that feature simulated investigations, enabling students to gain practical experience with industry-standard software. Some schools offer forensic accounting students two specializations: financial investigation or fraud prevention. Financial investigation focuses on the search for and documentation of misconduct and financial crimes. Alternatively, fraud prevention concentrates on looking for potential vulnerabilities in order to stop economic crime before it happens. Students who earn a bachelor's degree in forensic accounting online complete a variety of classes, many of which are closely related with criminal justice coursework. Students take classes in legal elements of fraud, investigating with computers, interview techniques, federal taxation, and auditing. Franklin's bachelor's degree in forensic accounting online program features a hands-on curriculum covering accounting principles, specialized forensic accounting knowledge, occupational fraud forensics, and detection and prevention techniques. Required classes include accounting information systems, legal elements of fraud, interviewing techniques, auditing, cost management, and fraud examination. Online students complete simulated investigations to gain experience using industry-standard software, correcting financial statements, and reporting findings. Graduates pursue professional certifications such as certified fraud examiner, certified public accountant, and certified internal auditor. Franklin's qualified online instructors have professional accounting experience and academic expertise. Admitted students may choose from multiple start dates throughout the year. A private, nonprofit university, SNHU offers an affordable online degree in forensic accounting and fraud examination. Students in the program explore theft detection thorough the investigation of financial records and graduate with a bachelor's of science in accounting with a concentration in forensic accounting. Classes include cost accounting, auditing principles, federal taxation, investigating with computers, interview techniques, and legal aspects of fraud. Online students gain a broad understanding of accounting principles, complex financial transactions, and essential business knowledge. The program offers flexible pacing so students can complete their degree according to their schedule. Applicants are accepted on a rolling basis. Transfer students may apply up to 90 previous credits toward their degree. Founded in 1865 as Indiana State Normal School, ISU is a four-year public institution located in Terre Haute. ISU offers a fully online degree in forensic accounting that prepares students to become certified public accountants. The 120-credit bachelor's degree in forensic accounting online program requires about 50 credits in business and economics core classes and 27 credits in accounting classes. The curriculum covers fraud examination, nonprofit accounting, occupational fraud, business computer systems, and federal income taxation. Students gain leadership, interpersonal, and communication skills. ISU recommends a sequence of coursework, which full-time students complete in four years. Transfer students may apply up to 90 previous credits toward the degree. UC's online degree in forensic accounting is a bachelor's degree completion program. The program focuses on fraud and financial crime and offers two concentrations: financial investigation and fraud prevention and detection. The financial investigation concentration teaches students to find and document misconduct and misdeeds, while the fraud prevention and detection concentration emphasizes the importance of identifying areas of potential vulnerability to economic crime. Students in both concentrations complete coursework in cyber security, criminal justice, government, and legal regulations. Applicants must hold an associate degree or have completed 57 credits at a regionally accredited institution. Depending on the number of credits the student brings, the degree completion program requires about three to four years. UNWO offers a 180-credit bachelor's degree in forensic accounting online program. UNOH's entirely online program emphasizes due diligence and vigilance during the preparation of financial statements, reports, and audits. Graduates are prepared to sit for the certified fraud examiners test. Classes are led by experienced accounting professionals and cover topics such as lean accounting, professional ethics, litigation, financial statement investigation, and interviewing for fraud. Applicants must hold a high school diploma or GED. Transfer students may bring up to 135 quarter hours or an associate degree. UNOH is not currently authorized to serve online students who reside in Maryland. Students interested in pursuing an online degree in forensic accounting have several variables to consider when selecting a program. For example, some colleges and universities deliver coursework asynchronously, encouraging more independent and self-directed learning, while other schools teach classes synchronously and require students to participate in real-time web conferences. Specific curriculum requirements, coursework, and specializations differ from school to school; however, all forensic accounting programs include classes related to auditing, fraud examination, and taxation. Below are a few sample courses you can expect to complete. Fraud Examination: Fraud examination courses teach students the methodology behind examining occupational fraud. Topics include causes of white-collar crime, detection and implementation of prevention strategies, evidence gathering, and writing forensic documents to report findings. Interviewing Techniques for Investigations: Courses on interviewing techniques teach distance learners useful principles and strategies for interrogating parties of interest, such as suspects. Students discuss verbal and nonverbal cues, the legal aspects of interviewing, and how to properly document findings. Auditing: All forensic accounting programs include at least one or two classes on auditing. These classes focus on compiling and reviewing financial statements such as assets, liabilities, and equity accounts of profit-oriented enterprises. Topics include standards, ethics, resolution of irregularities, and preserving evidence. Federal Taxation: Federal taxation courses examine the theory and practice behind filing federal income tax returns. Topics cover individual, employee, sole proprietor, and investor returns. Distance students examine exemptions, exclusions, deductions, technical research, memo documentation, and the Internal Revenue Code. How Long Does it Take to Get an Online Bachelor's in Forensic Accounting? Online courses represent one of the most flexible options for learning. Many students choose to take classes on a part-time basis and work full-time jobs while earning their degree. Many students, however, go to school full-time and complete their bachelor's degree in forensic accounting online program in four years. Some schools have generous transfer policies and allow incoming students to transfer up to 90 credits, expediting the graduation process. Most bachelor's degree programs require students to complete approximately 120 credit hours; these classes consist of a general education courses, business and economics classes, and forensic accounting-specific coursework. Colleges and universities offer different approaches and methods to online learning, including courses that are delivered asynchronously and synchronously. Some programs are more self-directed and flexible, while others are cohort-based, which means students go through a sequence of classes together as a group. When selecting a school for your online degree in forensic accounting, it is prudent to look for its accreditation. Academic accreditation ensures the quality of programming at an educational institution. Accrediting agencies are reputable organizations that verify the continuous upkeep and improvement of colleges and universities. There are two main types of accreditation: regional and national. Regional accreditation, which tends to be more prestigious and preferred by other institutions and employers, is a comprehensive educational review of an entire school. Alternatively, national accreditation has less strict standards. Nationally-accredited schools tend to be profit-oriented with lower tuition rates and more flexible admissions requirements. The U.S. Department of Education (ED) helps determine and approve accreditors and oversees all federally-recognized accrediting agencies. While the ED does not accredit institutions or programs individually, they do maintain a list of nationally-recognized accreditors and accredited schools. The Council for Higher Education Accreditation (CHEA) also plays a key role in the accreditation process; the CHEA is a leading advocacy membership nonprofit association of more than 3,000 U.S. institutions of higher learning. It works to strengthen the accreditation process. Click here to see a list of all CHEA-approved colleges and universities. The International Accreditation Council for Business Education (IACBE) is the accreditation leader in the quality assurance of business programs, including forensic accounting programs. The Association to Advance Collegiate Schools of Business is another popular organization and is made up of nearly 800 accredited business schools worldwide. Other prestigious accrediting agencies include the Accrediting Commission of Career Schools and Colleges, the Council on Occupational Education, the Distance Education Accrediting Commission, and the Higher Learning Commission. Earning an online degree in forensic accounting qualifies you to work in a variety of settings, including accounting firms, governmental agencies, law offices, insurance companies, large and small private companies, and nonprofit organizations. You'll also be prepared to sit for for professional certifications, such as a certified fraud examiner and certified public accountant, which could help you eventually start your own accounting or consulting business. Five of the most common career pathways are illustrated below. These professionals work closely with law enforcement officers and lawyers during investigations to search for traces of illegal activity and detect fraudulent financial activities and economic crime. They conduct financial investigations to ensure financial integrity and compliance. Forensic accountants often appear as expert witnesses during trials. Internal auditors evaluate their organization's operating guidelines and check for any mismanagement of funds. Their main goal is to ensure compliance with regulatory requirements, industry standards, and corporate policies. They also find ways to improve the auditing process, reduce financial waste, and prevent fraud. External auditors work outside of organizations to perform similar duties as internal auditors. Claims adjusters, appraisers, and investigators evaluate insurance claims and decide if and how much an insurance company must pay for a claim. They work to ensure claims are not fraudulent, confer with legal counsel, and negotiate with policyholders when necessary. Financial analysts, also known as securities analysts and investment analysts, assess the performance of investments (e.g., stocks and bonds). They work closely with mutual funds, securities firms, insurance companies, and pension funds to provide guidance and recommendations for investment decisions. Financial examiners review transaction and balance sheets and operate income and expense accounts. They also assess bank management to evaluate risks and ensure regulatory and legal compliance for banks and other financial institutions. Examiners sometimes specialize in risk scoping or consumer compliance. As the table below indicates, the median yearly income in the field of forensic accounting ranges from $52 to $64K. Overall, a worker's experience positively affects their income, although this influence is relatively limited for auditors, claims adjusters, appraisers, and investigators. Financial analysts tend to experience a salary increase in the first 10 years of their careers; however, additional experience does not play a huge role on their income. Distance learners can fund their degrees with grants, loans, work-study programs, and scholarships. Some schools also offer military and veterans' benefits. Upon enrollment, be sure to complete the Free Application for Federal Student Aid (FAFSA) form to apply for federal financial aid, such as the William D. Ford Federal Direct Student Loan Program. Merit-based scholarships are also available through professional accounting-related organizations, including the American Institute of Certified Public Accountants, the Association of Certified Fraud Examiners, and the International Association of Law Enforcement Intelligence Analysts.